Victorian 9 carat gold belcher chain necklace. This chain is composed of hand made evenly shaped rolo/belcher (oval links) that are embellished with lovers knot links, the design is subtle but far from plain. 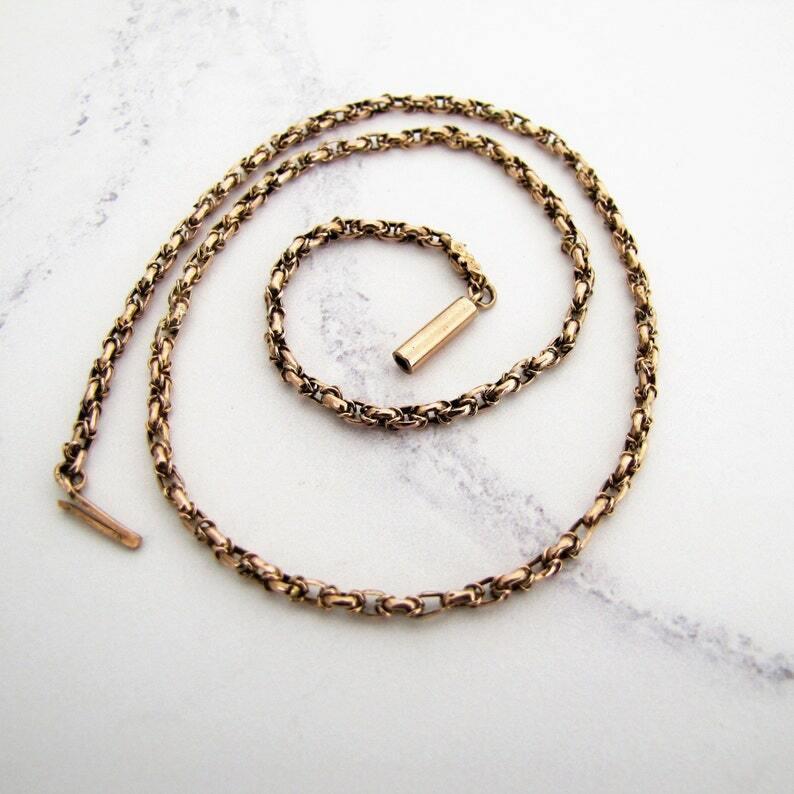 A secure and strong push in torpedo clasp fastens the necklace and the gold has that lovely rosy hue of antique rose gold. 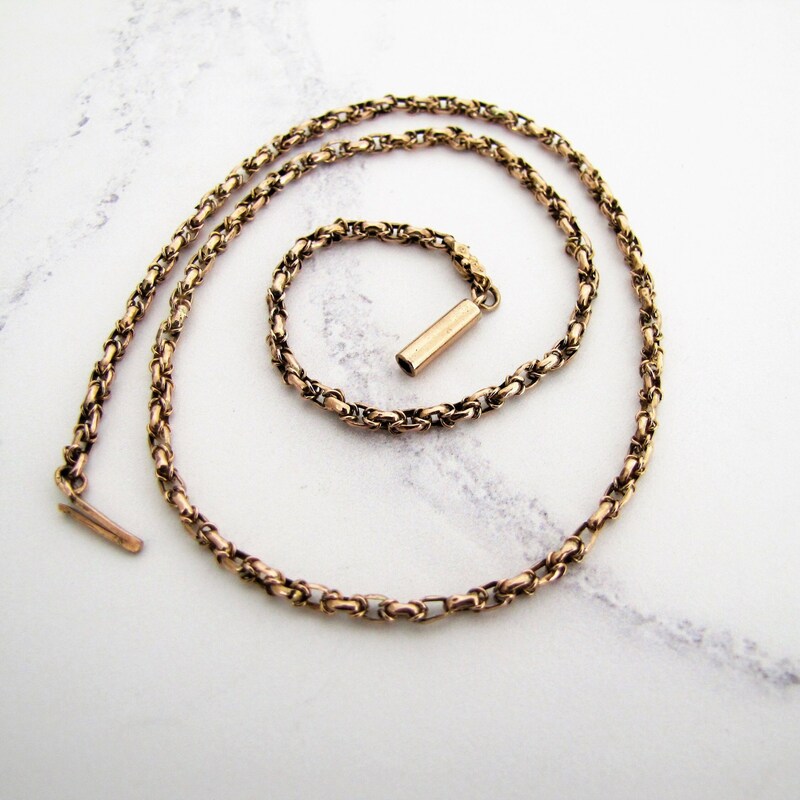 This versatile chain is thick and robust enough to support any pendant weight and can equally be worn on its own as a signature piece. Era: Victorian 1837-1901 and English in origin. Hallmarks: "9ct" on a double diamond plaque near the catch and tests as solid 9 carat gold throughout. Measures 42 cm / 16 1/2 inches long with links approx 3 mm wide. Condition: Very good with wear commensurate with age and the catch in perfect working order. There is a knot embellishment missing on one of the links, it is only noticeable under magnification and does not affect the necklace cosmetically nor does it affect durability. This is still a very strong chain that will last for many moons to come and it has been priced with this minor imperfection in mind. The treasured belcher chain, also known as the rolo chain originated in Britain in the 18th century and was named after the bare knuckle boxer Jem Belcher. Jem was the 'Champion of all England' between the years 1800 and 1805. Browse more exceptional fine and costume jewelry from every era - Georgian - Victorian - Edwardian - Art Deco - Modern - at mercymadge.etsy.com - With new arrivals added to our shop daily we offer an interest free layaway plan as well as a no risk guarantee. Your purchase will arrive gift wrapped in a Mercy Madge box. Perfect for giving or safekeeping! Antique Silver King Size Watch Chain Necklace. Victorian Pocket Watch Albert Chain, 23" Long/72 grams. Sterling Silver Graduated Curb Chain. 9 Carat Gold Paste Diamond Hand Ring. Swarvoski Crystal Designer Ring, Alternative Engagement Ring. Fede/Gimmel/Claddagh Style Hand Ring.